OVERSTOCK 56301N 3-Ring Binder for 3 On A Page Checks with Side Tear Vouchers 9 1/2 x 9"
Our 3-on-a-page compact checks feature attached stubs for convenience & complete recordkeeping! Deskbook check cover is made of durable vinyl for go-anywhere protection. Space between rings measures 2 3/4" between each ring. 3 Ring Binder with 1" diameter rings. Compatible with our compact 3-on-a-page checks (56300N). Overall size is 20 3/4" x 9" open. 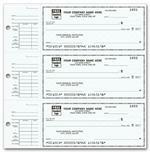 56300N 3 On A Page Compact Size Checks with Side Tear Voucher 6 x 2 3/4"